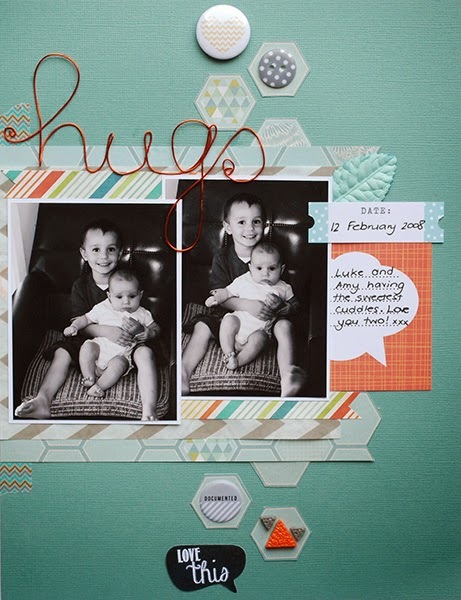 This is my last month with D-lish Scraps, so this is my second last share for Amanda's store. For this layout, I created a really cool heading out of wire. To do this, I wrote the word down on a scrap piece of paper and then I traced it with the wire. The word probably would have come out nicer if I had better cursive writing. Printing I can do, running writing, not so much. Anyway, back to the topic at hand, the layout I made. I even scrapped the smaller size this month as I just wasn't feeling like filling up a 12x12 page. Right now: I'm totally digging on the colour orange. What's your favourite scrapping colour at the moment? Great layout and I love how you made your own title from wire. No one favourite colour at the moment but I love yellow, pale blue and grey together. What a gorgeous colour combo!! !